Aristides de Sousa Mendes saved 30,000 people during World War II, 12,000 of whom were Jews facing certain death. As Europe faces another refugee crisis, his grandson argues that Sousa Mendes' courage and compassion is needed now more than ever. 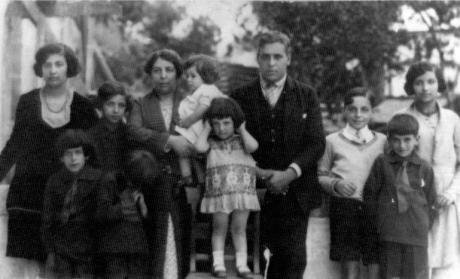 Aristides de Sousa Mendes with his family. Sousa Mendes Foundation. All rights reserved. Manuel Serrano: Aristides de Sousa Mendes, your grandfather, saved thousands of refugees during World War Two. Can you explain to our readers how he did it? Gérald Sousa Mendes: My grandfather, Aristides de Sousa Mendes, was a Portuguese diplomat, father of 14 children and Consul General of Bordeaux since August 1938. As millions of refugees were struggling to flee the Nazi-German invasion and killings in Europe in May-June 1940, my grandfather was confronted with multitudes of refugees that arrived there from northern France and all over Europe. The population of Bordeaux had tripled in a few days. My grandfather wanted to deliver visas but there was Circular 14 (issued by Salazar in November 1939) which forbade issuing visas to several classes of populations including Jews, Spanish Republicans, gypsies and other “undesirable” people. But as the situation deteriorated after the fall of France on June 14, he decided to issue visas anyway, in disobedience to Circular 14, in order to save as many people as possible. Starting on June 16, my grandfather issued several thousand visas from the cities of Bordeaux, Bayonne and Hendaye in the southwest of France, until the Foreign Affairs Ministry of Portugal was informed of his actions and invalidated his visas on June 23. The city of Bordeaux was bombed on June 19. Those refugees who were able to reach Portugal were treated very well by the Portuguese population. Most of them later emigrated to the Americas, or other safe havens in the world, while Aristides was put on trial by the Portuguese government, and then fired, blacklisted, and financially ruined. Our large family began taking meals at the soup kitchen managed by the Jewish community of Lisbon. This was during my father’s teenage years. Under this dictatorship, there was no more future in Portugal for Aristides and his children. All of the children, including my father Luis Felipe, had to leave Portugal to rebuild their lives elsewhere, mostly in the United States, but also in the Belgian Congo and (in my father’s case) in Canada. My grandmother Angelina died in 1948 and my grandfather Aristides died in 1954 in great poverty. My father arrived in Canada in 1948 where he met my mother (a French-Canadian girl), and I was born there. MS: Your grandfather chose his conscience over his orders, refusing to abandon those fleeing persecution. However, his altruism was overlooked in Portugal for decades. Why do you think that happened? GS: Unfortunately, it took decades for the Portuguese government to exonerate my grandfather and honour his memory. Even after the fall of the dictatorship in 1974, many in the Foreign Affairs ministry were claiming that Aristides had to be punished since he had disobeyed orders, although the world had recognized his heroic act to save all these people from Nazi barbarity. MS: Aristides de Sousa Mendes is being remembered today as a selfless individual and an example for those standing against injustice and indifference. How has the Sousa Mendes Foundation contributed to spread the word about what he did? GS: The Sousa Mendes Foundation was created in 2010 in the United States by members of the Sousa Mendes family and of families that he saved with the mission to document and disseminate the story, and also to raise funds for the rehabilitation of the family home located in Cabanas de Viriato (Portugal). With the flow of refugees that we see again today, I believe that it’s very important that the memory of my grandfather’s serves the present and the future as well, in order to avoid repeating errors of the past and to find ways to help those people who are leaving everything behind and taking huge risks in order to escape from their home countries at war. MS: There are many parallels between stories of refugees of 1940 and those of today. How important it is to learn the lessons of the past? GS: Today, millions of refugees are again forced to flee their countries at war. This is why the lessons of the past must be remembered for the present and the future. MS: But there is a fundamental difference between learning and applying lessons. The biggest refugee crisis since the Second World War is unfolding in front of our eyes, but many states refuse to accommodate refugees fleeing persecution and war. It´s 1938 all over again? GS: Yes, we see many parallels between the situation today and the one of the Second World War. Although people are from different countries and with different languages or religious backgrounds, they are human beings who have to leave everything behind including their homes and often their loved ones in order to run for their lives with unclear destinations and often by taking major risks. Many die on the road or on the seas while others are being blocked by countries who are closing their borders or parked in refugee camps where they are often subject to inhumane living conditions. MS: Your grandfather issued visas regardless of nationality, race or religion. Today, there are those who preach the opposite: Mr. Trump in the US, Marine Le Pen in France and Geert Wilders in the Netherlands. How can we fight this xenophobic and dangerous discourse? GS: I believe the best way to fight these attitudes is through education in order to remind our host countries of the lessons from the past, and to influence our politicians, our policy makers and decision makers. We know very well what will happen if we do nothing, and also how those who are saved today can contribute positively to our societies of tomorrow. MS: “It happened, therefore it can happen again”, said Primo Levi. How can we make sure that the tragedy that unfolded in Auschwitz and Treblinka never happens again? How can your grandfather´s altruism inspire us not only to be better, but to do better? GS: Every voice is important to influence our governments. The courage to care leads to improved societies for tomorrow, while ignorance leads to certain self-destruction. Life is filled with opportunities for individuals to make a difference.